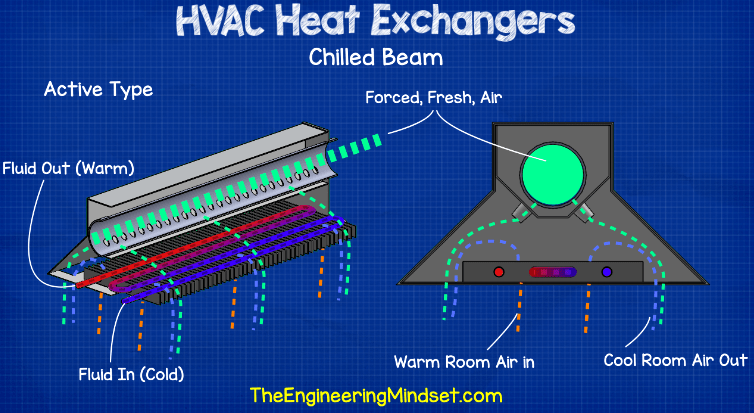 HVAC heat exchangers explained. 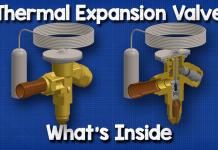 In this article we’re going to be discussing the different types of heat exchangers used in HVAC and building services applications for both residential as well as commercial properties. We’ll also look at how these are applied to system components to condition the built environment covering the working principle of common HVAC heat exchangers with animations. 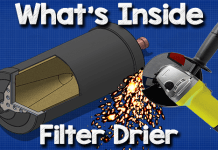 Scroll to the bottom to watch the video tutorial – includes detailed animations for each heat exchanger! A heat exchanger is exactly what the name implies, a device used to transfer (exchange) heat or thermal energy. Heat exchangers are either given a hot fluid to provide heating or a cold fluid to provide cooling. Thermal energy is transferred via three methods. 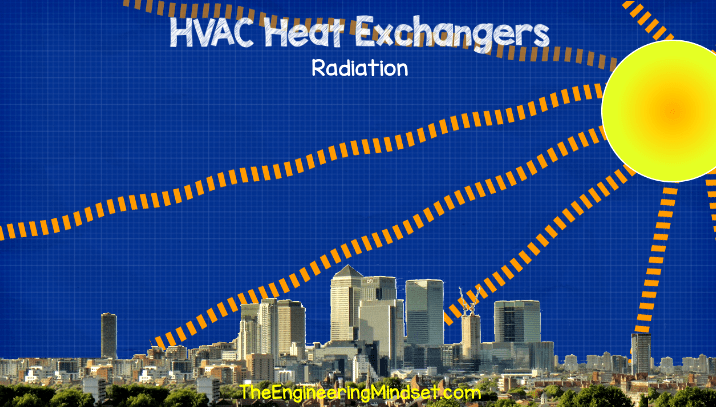 Most heat exchangers for HVAC purposes use convection and conduction. Radiation heat transfer does occur but it makes up only a small percent. Conduction occurs when two materials of different temperatures physically touch. For example, we place a hot cup of coffee onto a table for a few minutes then remove the cup, the table will have conducted some of this thermal energy. Convection occurs when fluids move and carry the thermal energy away. This can occur naturally or by mechanical force such as using a fan. An example of this is when you blow onto a hot spoon of soup. You blow the spoon to cool the soup down and the air carries this heat away. Radiation occurs when a surface emits electromagnetic waves. Everything, including you, emits some thermal radiation. The hotter a surface is, the more thermal radiation it will emit. An example of this would be the sun. The heat from the sun travels as electromagnetic waves through space and reaches us with nothing in between. The fluids used in HVAC system typically include water, steam, air, refrigerant or oil as the transfer mediums. 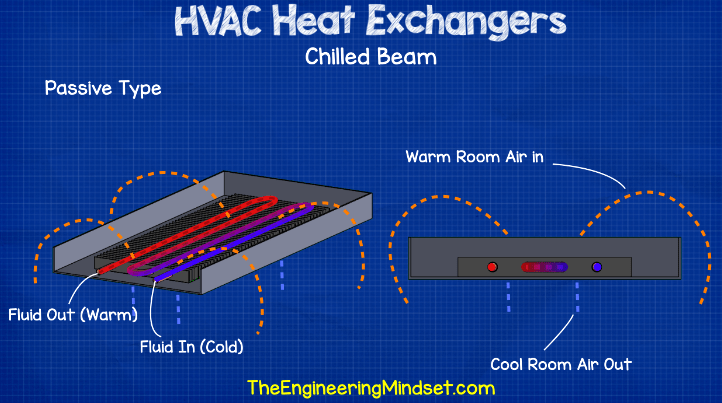 HVAC heat exchangers usually do one of two things, they either heat or cool air or water. Some are used to cool or heat equipment for performance reasons but the majority are used to condition air or water. 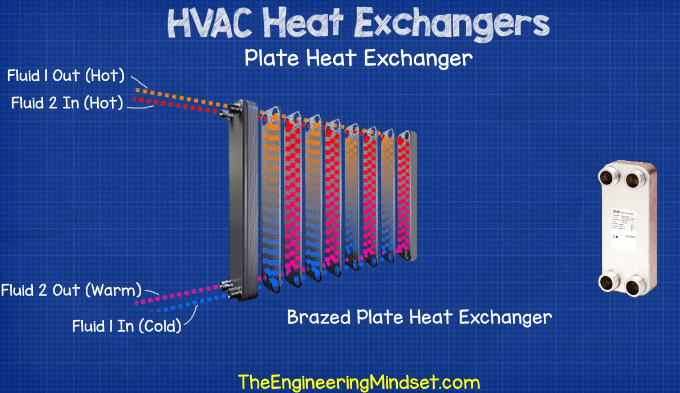 Most heat exchangers follow one of two designs. Either coil or plate design. Let’s have a look at the basics of how both of these work and then see how they’re applied to common heat exchangers in systems. Coil heat exchangers in their simplest form use one or more tubes which run back and forth a number of times. The tube separates the two fluids. One fluid flows inside the tube and another flows on the outside. Lets have a look at a heating example. 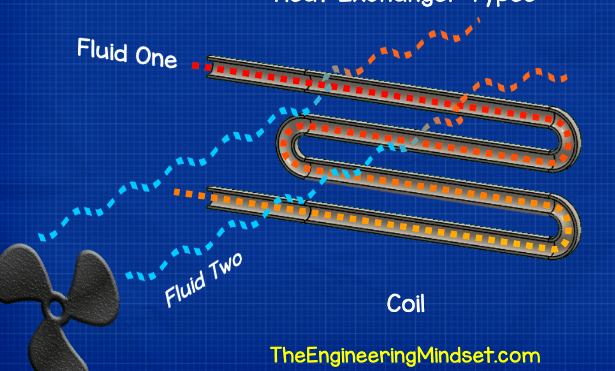 Heat is transferred from the hot inner fluid to the tube wall via convection, it then conducts through the pipe wall to the other side and the outer fluid carries this away also through convection. Plate heat exchangers use thin plates of metal to separate the two fluids. The fluids generally flow in opposite directions to improve the heat transfer. The heat of the hottest fluid is convected onto the plate wall and then conducted through to the other side. The other fluid, which is entering at a lower temperature, then carries this away through convection. 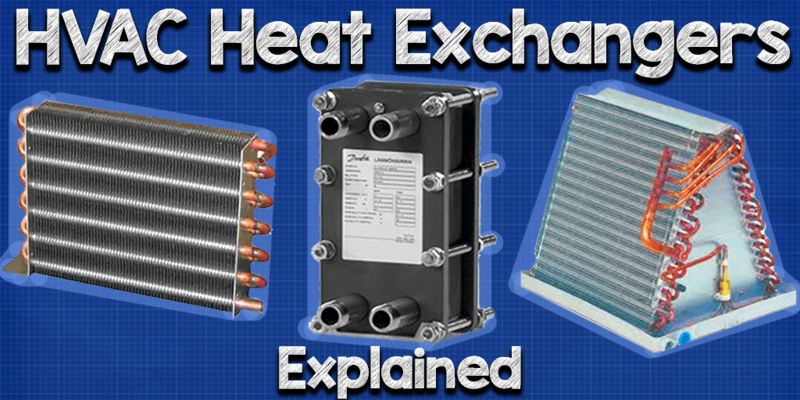 Let’s have a look in more detail at how these types of heat exchangers are applied to HVAC applications. 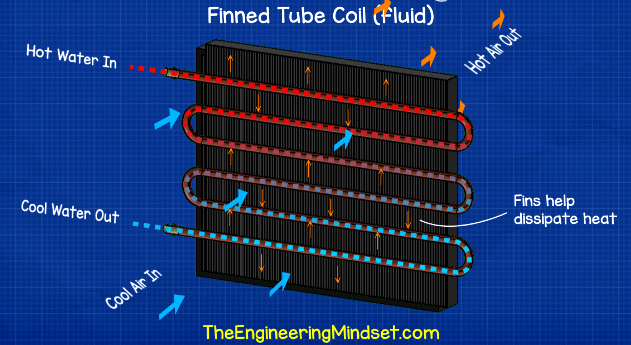 Finned tubes are often referred to as simply a coil e.g the heating or cooling coil. These are extremely common. You’ll find these in air handling units, fan coil units, ductwork systems, evaporators and condensers of air conditioning systems, on the back of refrigerators, in trench heaters, the list goes on. For these heat exchangers water, refrigerant or steam usually flows through the inside and air flows on the outside. For example, when used for heating air, using heated water, the hot water flows inside the tube and transfers its thermal energy via convection to the tube wall, there is a temperature difference between the hot water and the air so the heat is conducted through the tube wall. The air passing on the outside carry’s this away via convection. The fins usually connect between all the pipes, these sit directly in the path of the flow of air and help pull heat out of the pipe and get it into the air because this acts as an extension to the surface area of the pipe. More surface area = more room for heat to transfer. Duct plate heat exchangers are used in Air handling units to exchange thermal energy between the intake and exhaust air streams without moisture being transferred and without air streams being mixed. The heat exchanger is made from thin sheets of metal typically aluminium, with the two fluids of different temperatures flowing in opposite diagonal directions. Usually air is used in both but the exhaust gases from something like a CHP engine can also be used. The heat from one stream is convected onto the thin sheets of metal which separate the streams, this is then conducted through the metal where it is carried away by forced convection into the other stream. Trench heaters are installed around the perimeter of a building usually under a window or glass wall and are very common in new commercial buildings. Trench heaters are installed into the floor and their purpose is to reduce the heat loss through the glass as well as preventing condensation forming. They do this by creating a wall of convecting air currents. 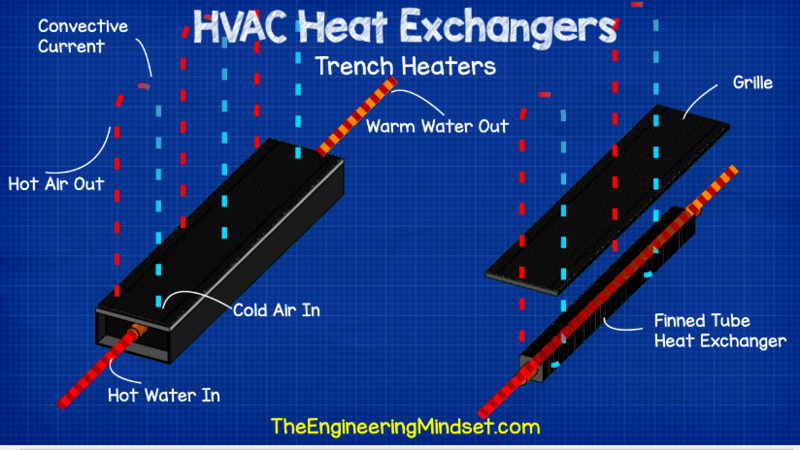 Trench heaters usually use hot water or electric heating elements to heat the air. Their position at the floor level means they have access to the coldest air in the room. The heat exchanger transfers heat to this via a finned tube, this causes the cold air to heat up and rise towards the ceiling. As this warm air rises up, colder air in the room will rush in to takes its place. This creates a convective current and a thermal boundary between the glass and the room. Open coil heating elements are used mostly in ductwork applications, furnaces and sometimes fan coils. These operate using exposed live coils of highly resistive metal to generate heat. These heat exchangers are placed directly into the flow of air and as the air passes across the coils, the thermal energy is transferred via convection. These provide uniform heating across the airstream although these are only used where it is safe to do so and can’t easily be accessed. Microchannel heat exchangers are an advancement on the finned tube coil providing superior heat exchange although these are only used for refrigeration and air conditioning systems. You can find these type of heat exchangers on air cooled chillers, condensing units, residential AC, air dryers, cabinet cooling and rooftop units etc. These type of heat exchangers also work using convection as their main method of heat transfer. The micro channel heat exchanger has a simple design. On each side is a header, running between each header are some flat tubes with fins in between. Air passes through the gaps in the fins to carry the thermal energy away. The refrigerant enters through the header and then passes through the flat tubes until it reaches the other header. The headers contain baffels which control the direction of the flow of refrigerant and are used to loop the refrigerant through the tubes a number of times to increase the time spent inside and thus increase the opportunity to transfer thermal energy. Inside each flat tube are a number of small holes known as micro channels which run the entire length of each flat tube. These micro channels dramatically increase the surface area of the heat exchanger which allows more thermal energy to get out of the refrigerant and into the heat exchangers metal casing. The temperature difference between the refrigerant and air causes the heat to conduct through the flat tube casing and into the fins. As the air passes through the gaps it carries this thermal energy away through convection. Furnace evaporators are commonly found in large homes and small commercial properties with small ducted systems. You can get larger coils that work on similar principles but for larger systems mostly for AHU’s in medium to large commercial buildings. The coil inside a furnace evaporator works the same as a finned tube heat exchanger and uses a refrigerant on the inside with ducted air on the outside. The air passing across the tubes transfers its heat via forced convection, this is then transferred through the tube wall through conduction, the refrigerant on the inside carries this heat away through forced convection, the refrigerant boils and evaporates away to the compressor. These are very common especially across Europe and north America in homes and older commercial buildings. They’re mounted to walls typically under a window to provide space heating. Their function is very simple, they are usually connected to a hot water pipe which is fed hot water from a boiler. The water enters trough a small diameter pipe and flows into the inside of the radiator. The internal area of the radiator is lager than the pipe which slows the water velocity down to allow more time for the heat to be transferred. 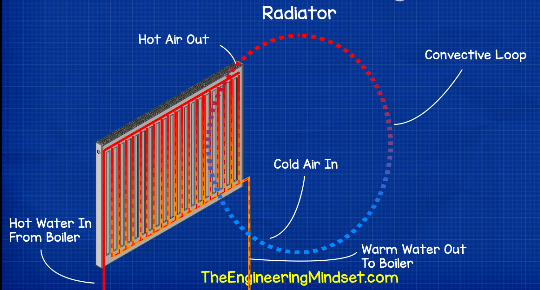 The heat of the water is transferred by conduction to the metal walls of the radiator. On the outside of the radiator is the air of the room. When this air comes into contact with the hot surface of the radiator, the heat will transfer into the air and this will cause the air to expand and rise. Colder air then moves in to replace this air causing a continuous cycle of moving air which heats the room, this moving air is therefore convection heat transfer. The radiator usually has some fins connected at the back or in between the panels especially on new ones, these are just there to extend the surface area of the radiator to provide more opportunity to transfer heat into the air. Radiators are incorrectly named as they transfer mostly via convection. Some times you’ll find specially designed radiators connected to steam systems but this is becoming less common, oil used to be used too but this is quite rare now a days. The water heating element is usually found in calorifiers and water heaters, it’s also sometimes used in the basin of open cooling towers to prevent the water from freezing in winter. These use a metal coil along the tube which has a high resistance value. This resistance generates heat. 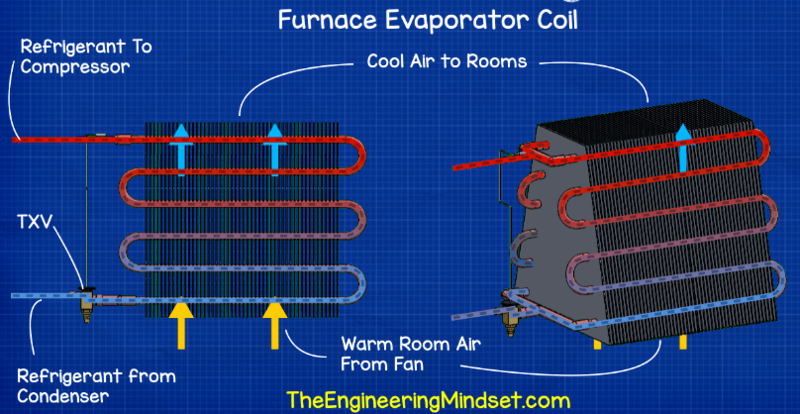 The coil is insulated to contain the flow of current but permit the flow of thermal energy. 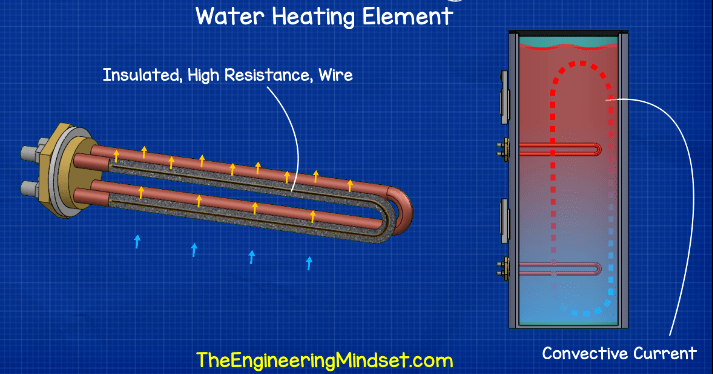 The heating element is submerged in a tank of water and the heat is conducted out of the element and into the water. The water which comes into contact with the heating element is therefore heated and this causes it to rise within the tank, cooler water then flows in to replace this heated water where this cycle will continue. These type of heat exchangers are usually found within the Air Handling Unit between the supply and extract ducted air streams. They work by using a small electrical motor connected to a pully belt to slowly rotate the heat exchanger disc which sits directly in the air flow between both the exhaust and fresh air intake. The air passes straight through the disc but as it does so it comes into contact with the material of the wheel. The material of the heat exchanger disc absorbs thermal energy from one stream of air and as it rotates it enters into the second stream of air where it will release this absorbed thermal energy. This type of heat exchanger will result in a small amount of fluid mixing between the intake and exhaust air stream due to the small gaps present where the wheel rotates, therefore it can’t be used where strong odours or toxic fumes are used. These heat exchangers can be used in the winter months to reclaim the heat from the buildings exhaust stream, this heat is captured by the thermal wheel and transferred into the fresh air intake stream which will be much cooler than the air inside the building. These heat exchangers can also be used in the summer months to recover cold air from the buildings exhaust and use it to cool down the fresh air intake. You find large boilers like this mostly in medium to large commercial buildings in cooler climates. Homes and smaller buildings will use much smaller versions, usually wall mounted. Both have many variations but this type is very common. Fuel is combusted in the combustion chamber (usually gas or oil) and the hot exhaust gasses are forced through a number of tubes until they reach the flue and are released to atmosphere. The tubes and combustion chamber are surrounded by water. The heat convects to the tube walls and is then conducted through into the water, this is then carried away by convection. Depending on the system design, the water either leaves as heated water or as steam. 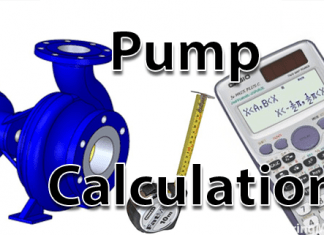 This water is forced by a pump, the speed of the pump as well as the amount of fuel combusted can be varied to change the temperature and flow rate. You’ll find these in solar thermal water heaters and some heat recovery AHU coils. If we look at the solar thermal application, we have a tube made from special glass which is evacuated from all air to create a vacuum and is then sealed. The inner layer of the tube has a special coating. The coating and the vacuum work together to prevent the heat from being able to leave once it enters the tube, it then helps move this to the heat pipe at the centre. 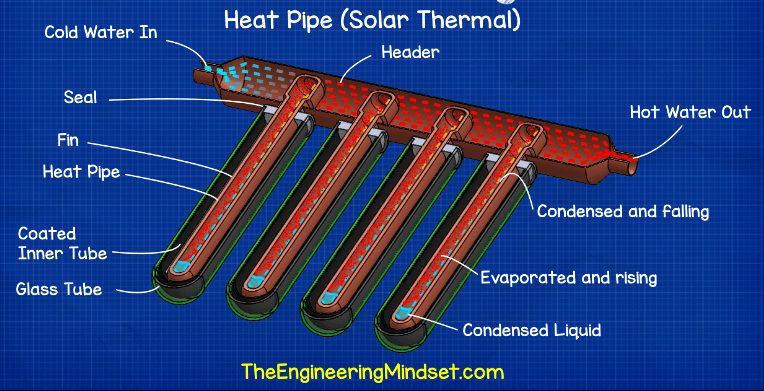 The heat pipe has a fin on each side connected to the tube coating to pickup the thermal energy. The heat pipe is a sealed, long, hollow copper pipe which runs the length of the glass tube and has a protruding blub at the top. The bulb is connected into a header and cool water is passed through the header to pass across the bulb head. Inside the heat pipe is a water mixture held at very low pressure. This low pressure allows the water to evaporate into steam with little heat addition. The steam then rises up into the bulb where it will give up its heat into the water flowing through the header. As the steam gives up its heat it will condense and fall back down to repeat the cycle. The tube absorbs thermal radiation, this is then conducted into the tube. The water inside convects this up to the bulb, the heat is conducted through the pipe wall and is carried away by convection into the stream of water. There are two types of chilled beams used, passive and active. Both are used mostly in commercial buildings. Active chilled beam work by passing a cool liquid, typically water, through a finned tube heat exchanger. Air is then ducted into the chilled beam and it exits through specially positioned nozzles. This air moves over the finned tube and blows the cold air into the room. Therefore, using forced convection. 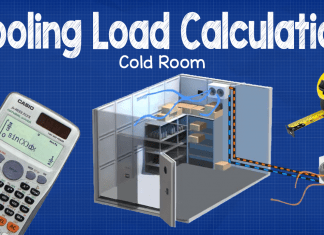 Passive chilled beams will also use a finned tube heat exchanger, but they do not have a ducted air supply connected. Instead they create a natural convection current by cooling down the warm air at ceiling level. This cooled air then sinks and is replaced by warmer air where the cycle repeats. 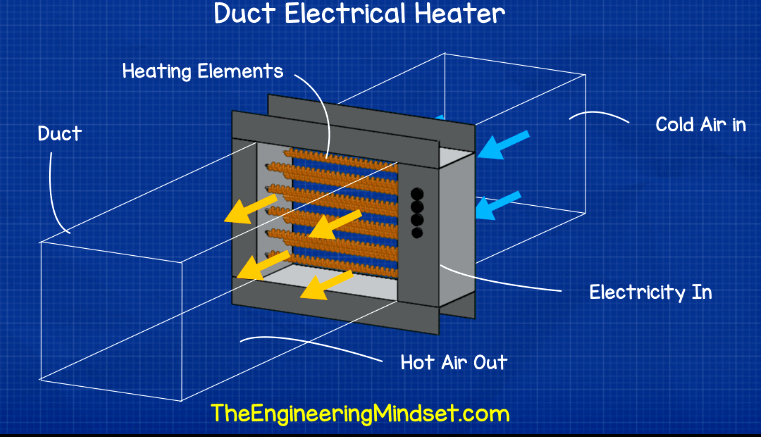 Furnace heaters are common in homes with ducted air conditioning. These are very common in north America. 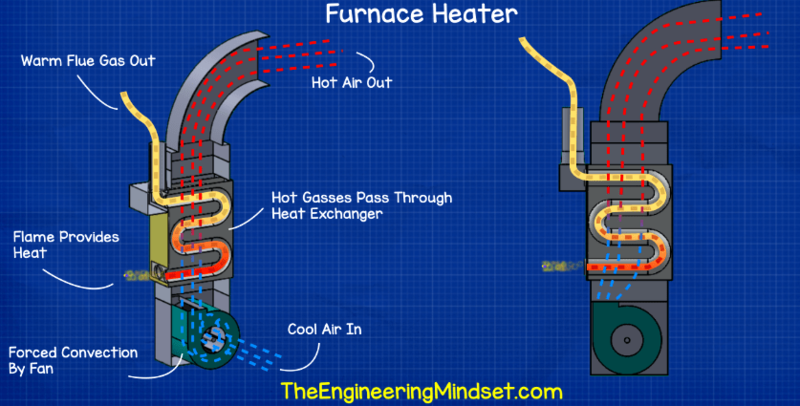 Furnance heaters use a heat exchanger placed directly into the ducted air steam. Fuel is combusted and the hot gas is sent through the heat exchanger, the heat of this is convected into the walls of the heat exchanger, the cooler ducted air passes across the other side causing a temperature difference so the heat of the gas is conducted through the wall and will be carried away by convection. There are two main types of plate heat exchangers, gasket type and brazed plate type. These are both very effective at transferring thermal energy, for even greater efficiency and compact design you can use micro plate heat exchangers for many applications. We’ve covered all these heat exchangers in great detail previously. The basic things to know about these two types of heat exchangers is that Gasket type can be dismantled, its heating or cooling capacity can be increased or decreased simply by adding or removing heat transfer plates. You’ll find these used especially in high rise commercial properties to indirectly connect chillers, boilers and cooling towers to the heating and cooling circuits and to connect buildings to district energy networks. Brazed plate heat exchangers are sealed units which cannot be dismantled, their heating or cooling capacity is fixed. These are used for applications such as, heat pumps, combi boilers, heat interface units, connecting calorifiers indirectly etc. Both work by passing fluids, usually in opposite directions, in adjacent channels. The fluids are usually water and or refrigerant. The thermal energy is convected onto the plate, it then conducts through the plate and the fluid on the other side carries this away through convection. Heat pumps are used mostly in homes but sometimes in commercial properties. There are two main types of heat pumps air source and ground source. Air source is commonly used for space air heating whereas ground source is more commonly used for water heating. Air source works like an AC system but in reverse, instead of removing heat from a room, it adds it. A refrigerant passes from the compressor to the indoor unit which contains a finned tube heat exchanger. The refrigerant transfers its heat by convection to the tube walls, it is then conducted through to the other side. On the other side is the cold air of the room which is forced cross the heat exchanger by a small fan, this then carries the heat away via convection. The refrigerant then flows to the expansion valve and then to the outdoor unit which is also a finned tube heat exchanger or a micro channel heat exchanger. As the air passes through this heat exchanger the ambient air will cause the refrigerant to boil and pickup heat. This heat then makes its way through the compressor to the indoor unit to repeat the cycle. Ground source works a little differently. A water and anti freeze mixture is pumped through pipes in the ground to pickup heat. This is then transferred into a small refrigeration cycle via a brazed plate heat exchanger. The refrigerant carries this to a second brazed plate heat exchanger which is connected to another water loop this time transferring its heat into a hot water tank usually through a spiral un-finned tube. 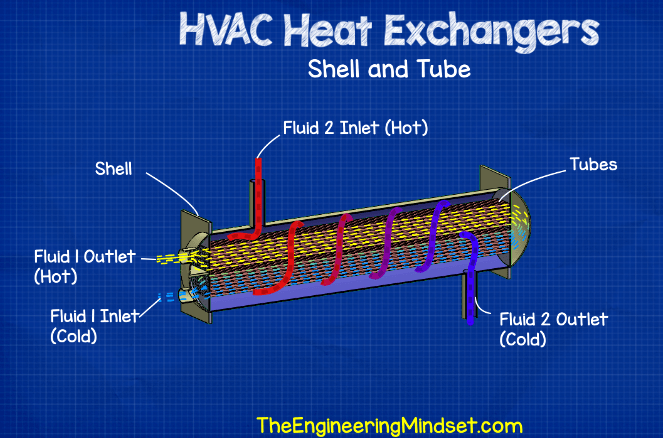 Shell and tube heat exchangers are typically found in chillers on the evaporator and or condenser, sometimes also as a lubricating oil cooler. These are possibly the simplist design of heat exchanger. They have an outer container known as the shell. Sitting inside the shell are a number of pipes known as the tubes. The tubes contain one fluid and the shell contains another fluid. The two fluids are always separated by the tube walls, they never meet or mix. The fluids will be at different temperatures which causes the thermal energy to be transferred between the fluids and this thermal energy will pass through the tube walls. When used in the evaporator or condenser the two fluids will be water and refrigerant. Depending on the design the water can be in the shell or the tube and the refrigerant will be in the other. 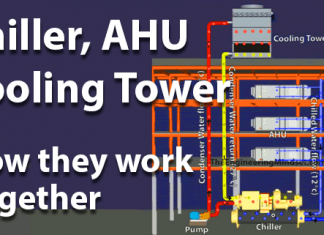 A chiller will use either a shell and tube heat exchanger, a plate heat exchanger or a finned tube heat exchanger. Many chillers will actually use a combination of all of these. 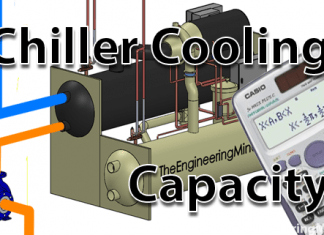 For example an air cooled chiller may use a shell and tube heat exchanger for the evaporator, a finned tube or micro channel heat exchanger for the condenser, a brazed plate heat exchanger for the compressors oil lubrication cooling and a gasket plate heat exchanger to indirectly connect the chiller to the central cooling circuit. 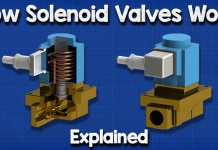 Epr valves: Do you have a video on this.